1. Helps in relieving the stress: According to the studies it is proved that the nervous system plays an important role in making the people realize about the emergence of pain in different parts of their body. 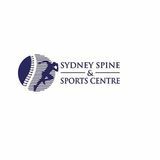 As the chiropractic problems are mainly due to misalignment of body organs, people start feeling the acute pain on different organs of their body. Undergoing, the chiropractic treatment helps in proper alignment of their body, thus helps them in enjoying the stress free life. 2. Improving the sitting posture: As referred above, due to hectic working schedule people are not sitting properly at their work place and prefer to sit according to their convenience. This, at the same time affects their sitting posture, especially their back and neck. Undergoing this treatment helps in improving the sitting posture and getting rid of their problem. 3. Improving the blood pressure: The chiropractic problems not only result in unbearable pain, but, at the same time also affects the regular functioning of your body and increases the blood pressure of your body, thus, putting extra pressure on your heart. 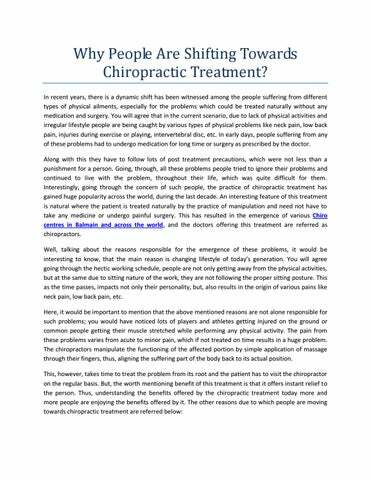 The chiropractic treatment is helpful in getting rid of all such problems, without using any medicine.